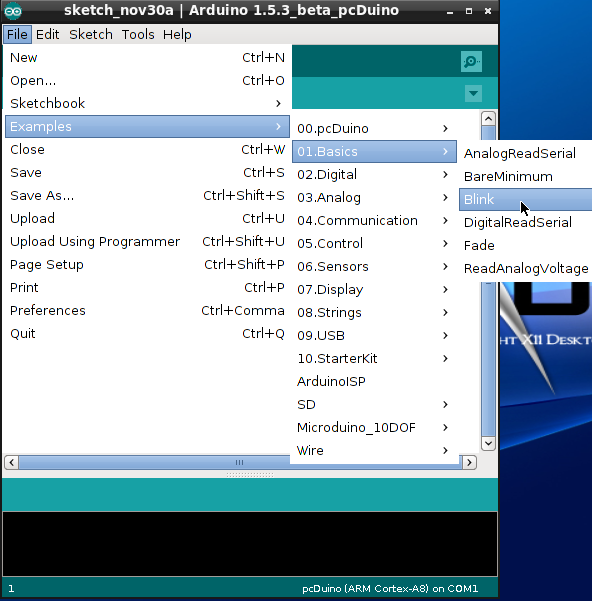 pcDuino8 Uno Ubuntu 14.04 sytem Image 20160102 has Arduino IDE built-in. We added a new board type ‘pcDuino’. By default, the board type is pcDuino. 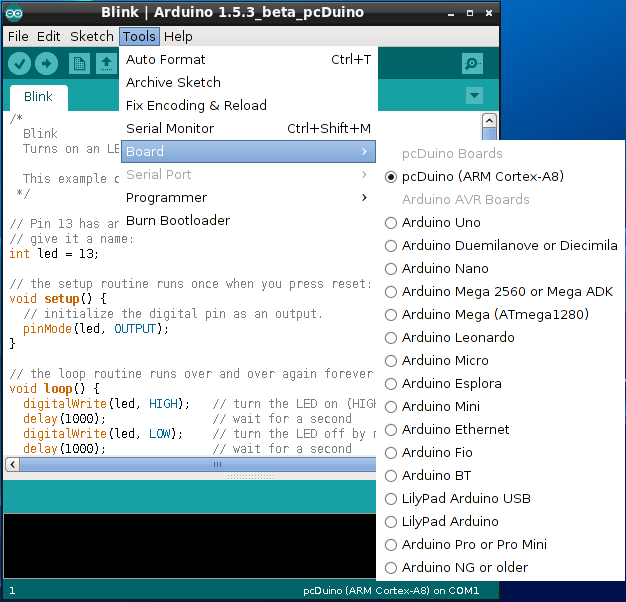 This part will tell how to program GPIO using Arduino IDE. 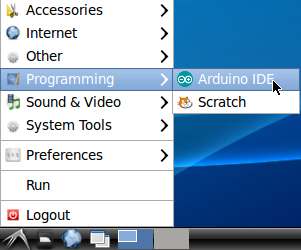 Click start menu and open Programming –> Arduino IDE. 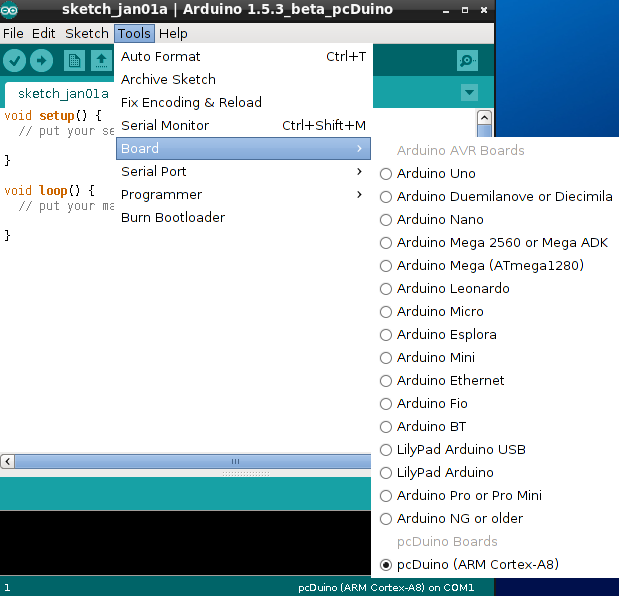 When you open the Arduino IDE, you can find a new board type ‘pcDuino’. Take a blink sketch as example. From Menu bar: File –> Examples –> 01.Basics –> Blink. Click this button to compile and run the source code. Please check the status of LED1, is it blinking? Note: The compiled binary file is saved at /home/linaro/Arduino. So you can manually run this file on Linux terminal. If you want to create a new design, just enter Ctrl+n, and open a window to input source code. This is the source code, if you have used Arduino before, you will notice that the programming language has no big difference between Arduino and pcDuino. Thanks for sharing, but I'm not sure this is relevant to the Tessel 2. Is it possible to use Arduino software for working with Tessel 2? Tessel 2 and Arduino Tian look similar, so in theory it sounds possible, but what is in practice? Theoretically, someone could write their own firmware, compile it and flash the SAMD21 via dfu-util—but I've never tried and don't know of anyone else that has either. When I installed the "Arduino SAMD Boards (32-bits ARM Cortex-M0+) by Arduino version 1.6.15" boards package via Boards Manager in Arduino IDE, I was able to select "Arduino Tian (MIPS Console Port)" and there was a port available for the Tessel 2 that I had plugged in. That's as far as I got.